﻿ Best Price on Hotel Candelaria Antigua in Antigua Guatemala + Reviews! Featuring a roof terrace with views of the Central Highlands, El Hotel Candelaria Antigua is in a beautiful colonial-style house with an interior courtyard. It is in the center of Antigua Guatemala. Each attractive room at Hotel Candelaria Antigua has traditional décor with wood-beam ceilings and wood furnishings. All rooms have free Wi-Fi, a sofa and cable TV. Guests can enjoy traditional Guatemalan cuisine in the Antigua’s charming restaurant. 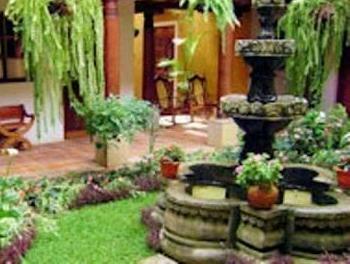 The hotel is within a 10-minute walk of Casa Santo Domingo Museum and La Merced Church. Guatemala City is a 35-minute drive away. Airport shuttle is USD 45 for groups of 1-3 guests and USD 55 for groups of 4-5. Please contact the property for more information.